Can you imagine yourself riding across a field on horseback with wind blowing across your face? 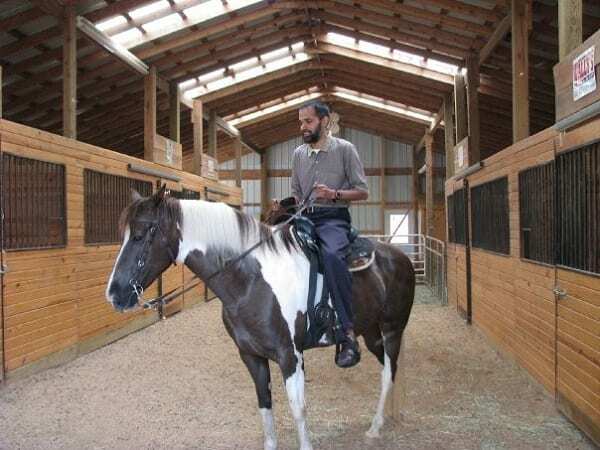 Is the idea of horseback riding exotic and makes you want to try it out since you now know its benefits and that it is a sunnah? If your answer is ‘yes’, then this article might answer some of your questions, In sha Allah. What If I Want to Purchase or Own a Horse? Taking care of a horse is not as easy as one may think. There are numerous things that must be done to prepare for buying a horse and keeping it healthy, happy and safe. Firstly, most horses cost a lot of money, especially if they are purebred, from a line of show horses or horses used in competitions. Do not just buy on instinct or gut feeling. Make sure it shows no signs of being hot-tempered, a horse like that could be dangerous to a rider or other animals that are kept. Of course, you should also ride the horse or have a friend with horseback riding experience ride it and make a judgement about the soundness of the horse. Choosing the right size and height of horse is important too. Many riders find that they outgrow their ponies and are forced to sell them when they become too tall to fit on the pony. Check the weight of your horse to make sure he is neither too thin nor too fat for his age and breed. A large variation in the average weight of the horse can cause behavioral problems such as laziness and higher chances of diseases or infection in your horse. Before taking the step of buying a horse, you should try to learn as much as possible about the horse’s history and ability. Has it had many owners? What is its health background? Is it suitable for all types of riders? And, one important question, why is the horse being sold? If there are behavior problems, a buyer needs to know this straight away. It would be a good idea to go to trusted sellers or to find out about the seller, if possible. As usual, it would be beneficial to make salatul istikhara before the process of viewing and buying. How Do I Look After My Horse? You should realize that the purchase of a horse is only the first step involving money. If you are keeping your own horse on your own property, then field shelters or barns need to be built and maintained to keep the horse cool in summer and warm in winter. Horses need a large grazing space as well, especially if they are to be kept in a space with other horses. Poisonous plants need to be carefully removed and the field checked for small harmful objects such as pieces of glass or metal wires, which could burrow their way into your horse’s feet or body, possibly injuring or even killing it. Also, be aware that yearly de-worming programmes, veterinary check-ups and farrier visits are necessary to keep your horse healthy. If you think you will not have a large enough grazing space for a horse, and decide to keep it cooped up in the barn all day long, be warned! Lengthy sedentary periods can cause bad habits such as crib-biting, wind-sucking or even bouts of anger or naughtiness. This would completely be the owner’s fault, not the poor horse’s! Think of it from your point of view, would you not be upset and restless too after being confined to a small boring room for the whole day? Horses prefer companions and they have personalities and problems too. If you choose companions for your horse, it is necessary to let them adjust to one another as horses tend to create their own hierarchies in the field. Even if a rider chooses to go out with other horses and riders, there can occasionally be problems. Thus, owners and riders have to be aware of their horse’s temperament, likes and dislikes. These can be found by merely watching your horse for long periods of time and monitoring its behavior among other horses or animals. Horses love to be groomed, especially on spots that they are unable to reach such as the back of the ears. Grooming helps you bond with your horse and increases healthy blood circulation in the horse. It allows both you and your horse to relax and destress, while at the same time giving you exercise and strengthening your muscles. Proper grooming kits should be bought and remember to examine the brushes for any defects of sharp parts that may irritate your horse. Make sure to clean the brushes daily to prevent a build-up of hair and dirt. What if I Just Want to Learn Horseback Riding? For those of you who do not want to take on the heavy, yet rewarding, responsibility of owning a large animal, there are alternatives. If you are eager to get in the saddle, then you can search for saddle clubs or pony clubs in your vicinity. Visit stables in your area to familiarise yourself with the types of horses and riding lessons that are available. Horses that are specially trained for riding lessons tend to be gentle and patient, especially with new riders. Private lessons are ideal for people who want to learn proper form in riding, though they are more expensive than group lessons. Before being allowed to ride out on their own, new riders must learn how to sit in the saddle and keep their balance, give signals to their horse and maintain control. For those of you who used to ride and still remember what you are supposed to do, thankfully you do not have to start at the bottom of the levels; you can freely choose your level, depending on your skill. Before lessons, while tacking up your horse, check that the reins and stirrups are long enough for you. The saddle should be snug, but not pinching, on the horse’s back, the bit placed properly in the mouth, and the bridle arranged correctly. After placing the bit in the mouth, do not feed your horse; it dirties the bit and makes your horse lose focus on the task of obeying you while riding. Do not spend your whole lesson sitting uncomfortably in the saddle. If you do not know how to alter the tack to fit you, do not be afraid to ask somebody. There are different styles of riding: Western, which does not have a particular dress code, and English, which is more formal. Be aware that some English riding clubs require a specific dress of tight fitting jodhpurs, something that may not be suitable for a Muslim rider as the body will be exposed through these form-fitting trousers. Riders might have to rent or invest in boots, helmets and riding clothes too. An alternative to jodhpurs would be boot-cut jeans that have a flared cut at the bottom to allow boots to fit easily. They are comfortable while also serving your purpose without being too tight. Helmets are a must-wear if you want to stay safe. Just a small scare can lead to your horse bucking you off, thus causing serious spine, neck or head injuries. A helmet is not just for show, it is for your protection. Long hijabs are not recommended as they could get caught in the reins and get in the way of your face as you move at faster speeds. So, it might be better to layer your clothing for modesty. Do not expect to learn everything in your first lesson. Asking questions is important; the more you know, the more you learn. Do not be too anxious about your posture; do not think too much or else you would not be paying attention to your horse. Most importantly, do not be disappointed if your progress in learning how to ride is slow at first. Good riders become better through patience, calmness and consideration for other less experienced riders. What Alternatives to Horseback Riding Are There? If it is not possible for you to own a horse, nor is it within your budget to attend horseback riding lessons, then you can increase your knowledge of horses and horsemanship at your local library. There are many popular, information-packed books and magazines for people who want to learn more about horses. Some examples include 1,000 Facts about Horses by Marion Curry, Horse and Rider magazine Horse Illustrated for older readers, and Pony magazine for younger readers. There are also many fiction books available, such as the widely known Black Beauty series, or the Marguerite Henry collection of books based on true-life events in the horse world. If you just want to be around horses and get used to them, then there are opportunities to volunteer with organizations that use horseback riding as therapy for children and adults with developmental problems. These organizations are always in need of responsible, committed people who can lead a horse, so riders can benefit from therapy in the saddle. This would be an excellent way of establishing relationships with people and horses, while at the same time giving sadaqah! There are even home-stay programs where horse and animal lovers can live on a farm and learn how to manage animals. These are the basics of what you need to know about horseback riding. I hope you have fun, peace and excitement if you decide to take up this wondrous and immensely amazing hobby. Please share your horseback riding experience in the Comments section. Rumaysa bint Saifullah is a Singapore-based home-educated student who loves riding her Nanny’s horses when she visits her in the US.